Since 1993 Corks London South has been London’s own private winery, accommodating all your wine needs. We offer full range of winery services and use only the purest water and finest ingredients available. We operate as a part of the Corks family of neighbourhood businesses that began operation in 1993. Our combined knowledge and experience allow Corks London South to deliver you the best wine making experience. Here at Corks, we strive for your wine-making experience to be satisfying and rewarding. This is why all our wines are 100% satisfaction guaranteed and we always look to you, our customer, to provide us with any suggestions and concerns that would in any way improve your experience. 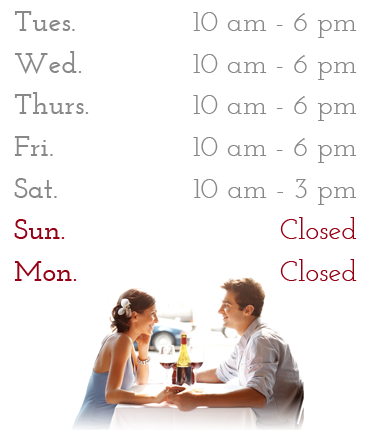 Hope to see you soon during store hours or by appointment! Here's the answer to soaring wine prices. If storage, selection or expenses are keeping you out of the fine art of wine making, then our line of SHOE STRING wines may be the answer for you. 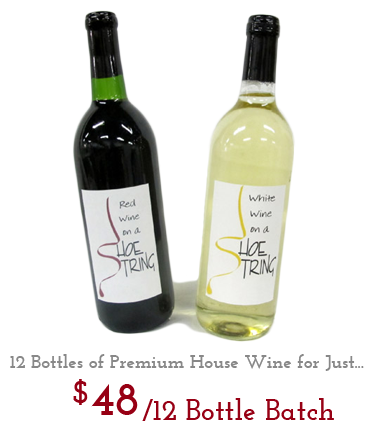 Now you can make 12 bottles of wine, white or red for only $45. What you will get is our premium House Wine which was selected from our best-selling red and white and branded as our SHOE STRING line of House Wine. You may have already tried our two most popular styles. Now if you need the occasional bottle of white or red wine, or if you just sip a glass every now and then, our twelve bottle batches may be just what you're looking for. Drop by and experience wine-making on a SHOE STRING only at CORKS.